Will Reconvene Next Tuesday for Routine Business Only, Declares Foreman Beck. 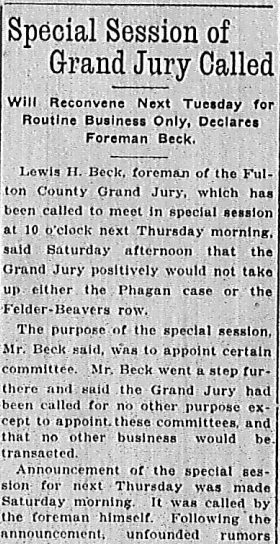 Lewis H. Beck, foreman of the Fulton County Grand Jury, which has been called to meet in special session at 10 o’clock next Thursday morning, said Saturday afternoon that the Grand Jury positively would not take up either the Phagan case or the Felder-Beavers row. The purpose of the special session, Mr. Beck said, was to appoint certain committee. Mr. Beck went a step furthere [sic] and said the Grand Jury had been called for no other purpose except to appoint these committees and that no other business would be transacted. Announcement of the special session for next Thursday was made Saturday morning. It was called by the foreman himself. Following the announcement, unfounded rumors were circulated to the effect that the Grand Jury would delve deeper into the Phagan murder and possibly also look into the Felder bribery charges.